Experience the best of the Caribbean on a 44' sailing catamaran. Enjoy the thrill of exploration, the elegance of a private yacht, the serenity of open water. 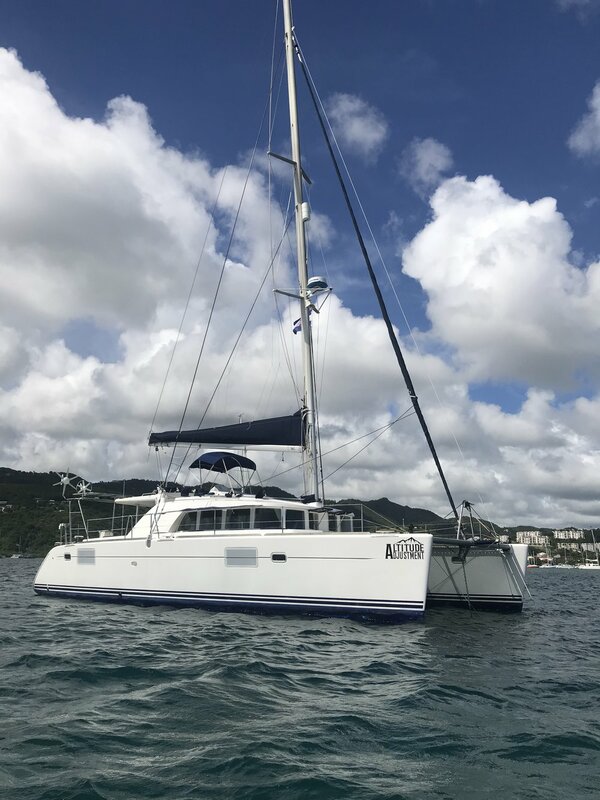 Altitude Adjustment is a 44’ Lagoon 440 sailing catamaran fully equipped with everything you need for a luxury Caribbean sailing vacation at an affordable price. She is complete with four air-conditioned queen cabins with private ensuite bathrooms, showers, a spacious interior salon, generous exterior spaces including a beautiful open-air dining area, wet bar, sun lounging areas and flybridge seating. Sailing Vessel Altitude Adjustment is owned and captained by Brian Saupe, a retired police officer and engaging mariner. With a lifetime living on the water and more than 40 years of boating experience, Brian provides his guests with a safe, fun and adventurous Caribbean sailing vacation. Captain Brian’s warm personality and deep knowledge of this Caribbean paradise are why Altitude Adjustment Cruises is one of the top sailing vacations in the Caribbean. His delicious homemade meals, daily craft cocktails, custom-created games and entertaining sailing stories are the icing on top. Learn more about Captain Brian here. A sailing vacation aboard Altitude Adjustment is your vacation, your way. We’ll sail at your pace to the places you want to go and see. Looking for ideas? Captain Brian knows every nook and cranny of the Caribbean, from St Thomas and St John, to the islands of the British Virgin Islands, Puerto Rico and the Spanish Virgin Islands, and as far south as Grenada. You make the time, Captain Brian and Altitude Adjustment will make your time aboard the vacation of your life. Learn more about planning a private Caribbean sailing vacation here.